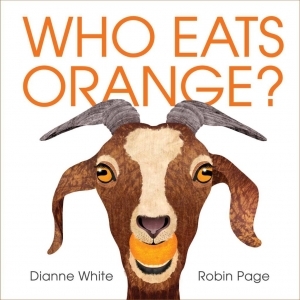 Today we welcome Dianne White, writer of Who Eats Orange?, a picture book illustrated by Robin Page out now from Beach Lane (Simon & Schuster)! Who eats orange—a bunny? A chicken? Maybe you? 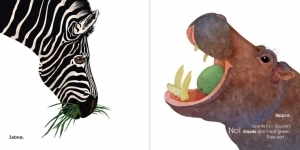 Find out in this unique exploration of the rainbow of colorful foods eaten by animals around the world. Dianne is a member of the Whirligigs (2007) and is also the author of Goodbye Brings Hello (HMH, 2018), Blue on Blue (Beach Lane, 2014), and Green on Green (Beach Lane, 2020). Dianne, tell us about the spark that ignited Who Eats Orange? When I talk to kids, I like to tell them that the ideas for my stories come from the ordinary, everyday things in my day. The spark for Who Eats Orange?, for example, came while I was on a field trip with kindergartners at a local farm. When it was time to eat, a little boy reached into his lunch bag, pulled out a piece of fruit, and asked, “Who eats orange?” As soon as I heard it, I knew that phrase would make a great title for a book. But what would it be about? I made a note and revisited that title off and on. It would be several years of playing around with the idea before I figured out what the structure would be. Once I had that, the rest came fairly quickly. What nugget of craft advice has been especially helpful to you? It’s easy for picture writers to get in a rut, circling through the same set of stories. Revising is necessary and putting words in their “best order” takes time and thought. But revision of what I call “old favorites” can’t be at the expense of writing new work. Clock at least as much time exploring new ideas and stories as you spend revisiting older work. Do you write in silence? Who were your advisors at VCFA? Phyllis Root, Jane Resh Thomas, Marion Dane Bauer, Tim Wynne-Jones, and Kathi Appelt (for a post-grad picture book semester). How did attending VCFA affect your writing life? VCFA changed everything! Besides introducing me to a community of writers who were just as dedicated to developing their craft as I was, it also brought into my life a small group of women who remain, 11 1/2 years after graduation, among my closest and dearest friends and favorite writers. Thanks, Dianne! Readers, visit Dianne online to learn more about Who Eats Orange? Read reviews below, and check out this awesome activity kit to print and complete with your little readers! 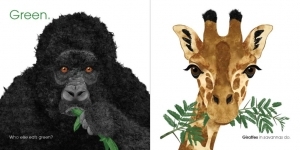 Eye-catching art and lively question-and-answer format combine to introduce different animals and the colorful foods they eat… The spare, anticipatory text will have lots of appeal for kids, especially in concert with the bold, brightly colored collage-like digital illustrations…An entertaining introduction to animal diets. 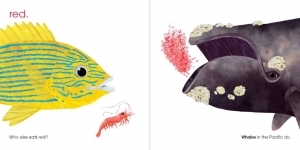 A vividly colored yet simple lesson on what animals do and do not eat…the rich back matter provides detailed information on different animals (sorted by environments) and the foods eaten there…a welcome addition to lessons on colors, nutrition, and the animal kingdom and it also provides a launchpad for additional discussion and research.